Reading is one of the past times I love…sometimes coming first when I should be updating my blog. I try to read at least two books a month and also the monthly magazines related to homes or real estate. While reading the Feb/March issue of Better Homes & Gardens Remodel, I came across an article featuring the kitchen makeover of some home grown Minnesotans. The problem was to some how create a kitchen that was more user friendly. The cluttered kitchen desk, lack of storage space, poor lighting, and outdated cabinets & countertops just had to go. The couple sought the help of local architects Petra Schwartze and Dan Nepp to rework the area. What they produced is beautiful. A huge center island that looks like furniture, a gas cooktop that I envy, plenty of storage (including a hidden desk), and a soft butter-yellow color that instills a sense of peace and happiness to me. In other words, I love this kitchen! 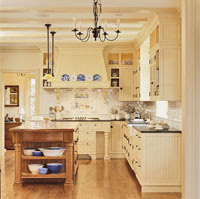 It has a touch of country, a twist of French, and just enough modern to make it work with today’s lifestyle. The bead board, door pulls, and showcase niches above the cabinets are creative touches that make the kitchen such a star. You might be thinking, I want a kitchen makeover too. Well, before you begin, make a list of the problem areas you want to change, then come up with a budget. With all our projects, I add another 10% on top of the price just in case I need to upgrade or add something later. Doing the job yourself is an obvious option, just be honest with yourself on what you can handle. The other option, while more expensive, is to pay a local Minneapolis architect to design the space for you. They tend to have ideas you never even thought possible and are able to change floor plans to make the overall home flow better. Do your homework, ask for referrals, and request photos of completed projects. Remember, it is your vision, so stay true to what you want and don’t be afraid to speak up if you don’t like something you see. In the end, you’re the one who has to live with it! To read more about this featured home article and view some interior photos of the the fabulous Minneapolis remodel, click here .